Q. Why does Hillary Clinton reject the Bible? A. She didn't write it. According to The Hill, Hillary Clinton's shortlist for veep will include at least three Hispanic politicians. On hearing the news, Elizabeth Warren held a hastily arranged press conference to announce that she now has both Indian and Spanish blood. With liberty and justice for none. Are any of your friends, family members, or business associates mentally ill? Here's a quick test you can use to find out: Just ask them if they are planning to vote for Hillary Clinton. Don't let them test my DNA. Our Ambassador to Libya, Chris Stevens, is under attack and begging for assistance. Has he made a donation to my Clinton Foundation? We don't show him on the donor's list. Then what difference does he make? It is well known that power corrupts and absolute power corrupts absolutely. That isn't something we have to worry about when it comes to Hillary Clinton. She's already 100% corrupt. As hard as it it to imagine, Hillary Clinton may be even more criminal than Barack Obama. If she is elected President, Obama's last official act will be to pardon Hillary, and Hillary's first official act will be to pardon Obama. Hillary Clinton can't be called a stuffed shirt. She is more of a stuffed pantsuit. Hillary Clinton has finally broken her silence and promised to improve foreign relations with Hawaii. When people make money, tax them. When people have a business, regulate them. When foreign governments donate to Hillary, send them arms. When it comes to the American economy, Hillary Clinton is the exact opposite of Barack Obama. President Obama is tax and spend. Hillary Clinton is spend and tax. $tarbuck$ has started selling a new flavor of coffee that they call the Hillary. It has been a very poor seller so far because it is so extremely bitter, despite being filled with artificial sweeteners. There's a new Hillary Clinton support group named Soldiers for Hillary. Of course, none of them are American soldiers. Hillary Clinton claimed this week that she still has a 50% voter approval rating, unless you include taxpayers. Q. Why does Hillary Clinton want more gun control? A. To stop Republicans from using guns to defend themselves against Democrats. 1. Hillary stole the spoons by mistake. 2. Hillary misinterpreted the spoon stealing rules. 3. Hillary forgot the spoons were in her pantsuit. 4. Hillary needed those spoons to eat with. 5. Hillary didn't steal any sporks. 6. Hillary returned some of the stolen spoons. 7. Hillary couldn't return any spoons she had already pawned. 8. Hillary cut the National Park Service a check after they caught her. 9. Hillary thinks her servants took some spoons too. 10. Hillary says it is all Bill's fault! 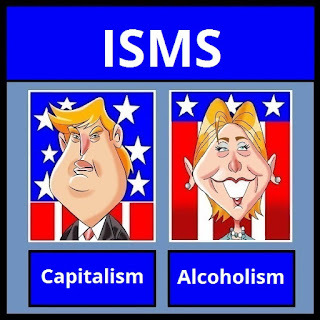 Rocky D from the Scorpion Radio Group contributed, "Meanwhile, reporters are saying that zillionaire Susie Tompkins Buell, from San Fran-sicko, is Hillary's 'soul mate.' That's impossible. Hillary has no soul." President John Kennedy had a dream of putting men on the moon. Hillary Clinton has a dream of putting men in little girls rooms. Despite having a press corps that is almost entirely in the tank for her, Hillary Clinton occasionally faces some mild questioning regarding her criminal activities as Secretary of State. Whenever this happens, she responds with hysterical rage. To paraphrase Noel Coward, Hillary Clinton can take any amount of criticism, so long as it consists of unqualified praise. Hillary Clinton's has two goals in her life; to delete all of the incriminating evidence against her and to destroy America. And Hillary is all out of evidence. Hillary Clinton has promised her donors that she will burn Donald Trump down to the ground in any upcoming debate. The only way that happens is if Hillary brings along her old pal Janet Reno. Hillary Clinton has been screeching at Donald Trump to release all of his personal tax returns. The Donald responded, "I've already emailed them to you!" The Fact Changers at PolitiFact says Donald wasn't telling the truth when he called Hillary a world-class liar. They're partially right, but only because Hillary Clinton has no class. Q: What would happen if Hillary Clinton made Bill take Viagra before going to bed with her? Q. Why did Hillary Clinton buy herself a broken polygraph machine? A. So she wouldn't have to stop lying. Michele Obama, angrily denigrating our nation's White House, said that she lives a house built by slaves. Hillary Clinton uses the less inflammatory and more politically correct term. "A new poll says that 31% of Americans think Hillary is honest and trustworthy. The margin of error for this poll is 31%. The other 69% laughed so hard at the question, they couldn't answer." If she is convicted after she is elected, Hillary Clinton may have to wear a White House Arrest Ankle Bracelet. Assuming anyone can make one big enough. Hillary Clinton has come out in favor of forcing women to register for the military draft. However, Hillary does support women being able to avoid mandatory military service by claiming either conscientious objector status or registered Democrat status. Unlike Barack Obama, Hillary Clinton doesn't intend to run a lawless White House. Hillary will have plenty of laws. We will just have to check with her daily to see what they are. The motto of the United States of America, first signed into law by President Dwight D. Eisenhower in 1956, is "In God We Trust." If Hillary Clinton has her way, it will be changed to, "What happens in the Oval Office, stays in the Oval Office." Q: What English word has no equivalent in HillarySpeak? If she is elected President this November, Hillary Clinton will be the first President who won't be able to get a security clearance. I'm not saying that she's a drunken sot, but most people buy wines with vintage dates. Hillary Clinton buys all of her wine with expiration dates. The Associated Press has just declared Hillary Clinton to be the winner of the November General Election for President of the United States, based on polling data provided to them by Hillary's campaign. Mark Twain is credited with observing that, “A lie travels around the globe while the truth is putting on its shoes.” That's still true today, because Hillary Clinton travels by jet. Q. What time will it be when Hillary Clinton sits her wide load down at the President's White House desk? A. Time to get the chair fixed. There have been rumors that Joe and Hill don't get along. Nothing could be further from the truth. In fact, Plugs has been getting all of his hair transplants from Hillary's back for the last several years. In a remarkable show of bipartisanship, Hillary Clinton has named a Republican as her preferred future White House Press Secretary. It will be Lyin' Ted Cruz. Once she has finished with her coronation, Hillary Clinton will convert the Oval Office into her Throne Room. Glenn Beck will be her official White House jester. Hillary Clinton has agreed that Bill can have all the female interns he wants if the two of them make it back into the White House, but only when she is done with them first. Hillary Clinton vowed to make stopping "lone wolf" terrorists a top priority if she is elected President. Hillary claimed that we should start by shutting down the FBI's investigation of her in order to free up the additional agents needed. If Hillary Clinton ever makes it back into the White House, she will rename the West Wing the Left Wing. Why Isn't There a Background Check For Candidates? Q. How can a terrorist buy a gun while being investigated by FBI? A. The same way Hillary Clinton can run for President. It's one of Hollywood's most closely guarded secrets, but Hillary Clinton may have a cameo appearance in the new all-female Ghostbusters film. After the Ghostbusters crew captures each additional dead spirit, Hillary will briefly appear dressed as the Grim Reaper to register the ghosts to vote. Hillary Clinton is so old that she is going to wear a Hillary mask for Halloween. Hillary Clinton is so old that she gave Eve the apple in the Garden of Eden. Hillary Rodham Clinton has been calling Donald Trump a demagogue. In Hillary-speak, demagogue means anyone that she is afraid to debate. Hillary Clinton's donors are searching for a suitable running mate. Whoever they eventually settle on absolutely cannot be an alcoholic. 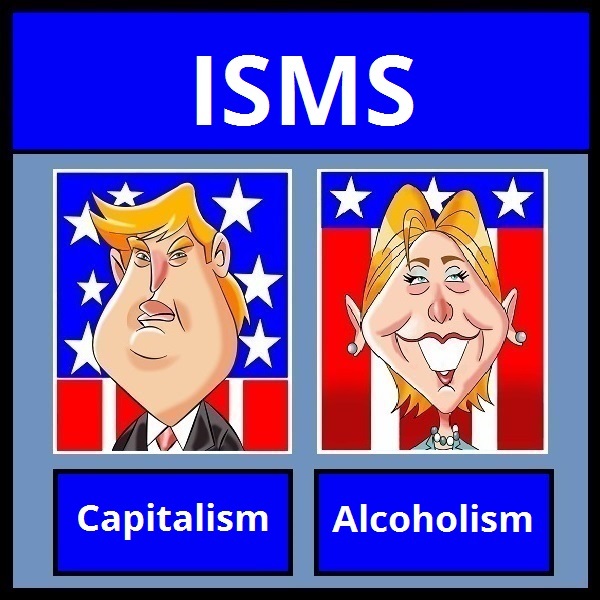 There has to be at least one sober candidate on the ticket. Hillary Clinton is so old the Book of Revelations was written about her. 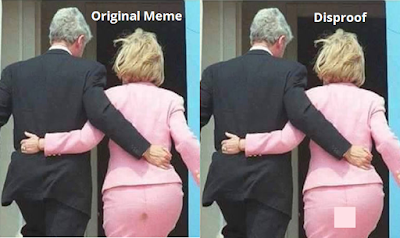 A picture of Hillary Clinton showing a poo spot on the back of her skirt has gone viral on the Web, much to the dismay of Snopes, a site dedicated to promoting Hillary 24/7 and "fact-checking" Internet jokes. Snopes has fired off a post claiming that the original joke meme was digitally altered. The MSM keeps saying that electing Hillary will be historic because she would be the first female President. But if gender is nothing more than a matter of choice, couldn't she just switch to being a male before she's sworn in? Donald Trump hopes to become President through his promise to build a wall on our southern border after he is elected. Hillary is taking a more proactive approach by placing a solid line of Voter Registration Stations along our southern border before the election. According to astrophysicist Adam Riess, at the Space Telescope Science Institute and Johns Hopkins University, the universe is now expanding as much as nine percent faster than astronomers previously measured. Scientists are currently divided on the cause, but there is a preliminary consensus that the expansion is due at least in part to Hillary Clinton's increasing pantsuit size. Hillary Clinton expects to win tomorrow's California primary for the Democrat Party's presidential nomination. If she manages to get by Bernie Sanders, she intends to send both of her friends a telegram to let them know about her victory. Hillary Clinton caught her husband giving her "special" aide Huma Mahmood Abedin the eye. Hillary angrily warned him, "Don't even think about it, Bill. She's mine!" Despite her falling poll numbers, Hillary Clinton is certain that she will be able to buy the election with all her "donations" from Saudi Arabia. She is so certain that she will win that she has already begun drawing up her White House staffing plans. For instance, all of First Lady Bill Clinton's interns will have to wear braces. Desperately in need of additional campaign funds, Hillary Clinton offered to sell her soul to the Devil. He asked Hillary if she could break a dollar. Bryan Pagliano, who helped set up Hillary Clinton's illegal email server, has announced that he intends to take to take the Fifth at his upcoming deposition. As a show of support for her "alleged" fellow conspirator, Hillary intends to take a Fifth to the deposition.